A constitution and by-laws were drawn up and adopted. A soliciting committee, comprised of Enoch Woodbridge, E. H. Hall and L. Scoles, was appointed to sell lots at a price of not less than $5 per lot and all proceeds were used to buy and improve the original 8 acres that make up the east side of the cemetery. The original cemetery ground was purchased for $25 per acre on August 3, 1868 from T. D. Coryell. On May 10, 1869, plotting of the ground into lots was made. These were the charter members: H. A. Scales, George Wood, Wm. T. Colt, E. W. Barren, Cyrus H. Wait, John S. Hall, J. A. Wade, Henry Baker, R. M. Nevins, S. W. Byers, Z. P. Mitchell, and T. D. Coryell. Weeks later, on June 19, 1869, the first burial was performed, that being of Mrs. Sarah Carpenter. 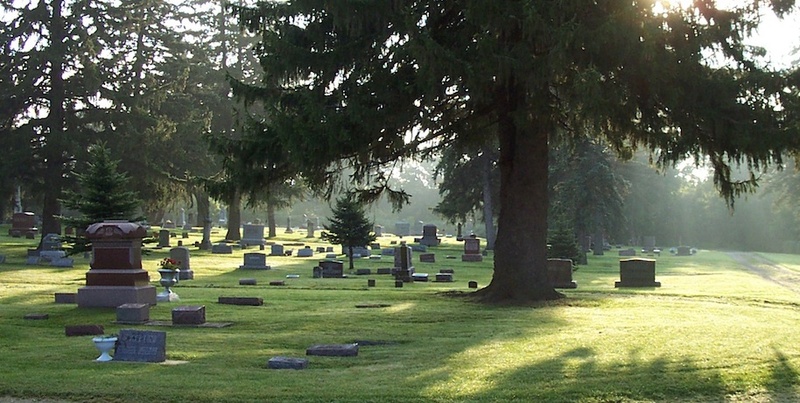 As the years passed, more land was added, trees were planted and Oak Hill Cemetery became firmly established as a fitting “City of the Dead.” The cemetery had become known for the beautiful view of the Cedar River valley and numerous majestic trees. In the early years, many burials were of those who had been disinterred from other local cemeteries and reburied here. The earliest known death of someone re-interred in Oak Hill was John Emery Hall, who died in September, 1855. The Soldier’s Monument stands at almost the highest point in the cemetery and faces the north. 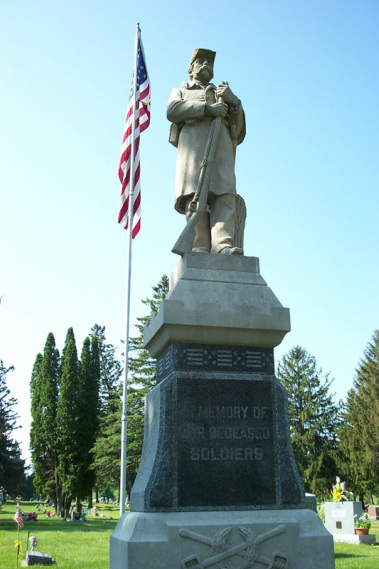 On a foundation of cement is set a base of granite on which is a block of marble with the words, “In Memory of our Deceased Soldiers.” Above this is the figure of the soldier, six feet two inches in height and cut in one piece from Bedford Granite. The figure alone weighs 1,500 pounds. It is as fine a monument to the memory of our departed soldiers as can be found in any cemetery around. It was dedicated by members of the George S. W. Dodge Post of the Grand Army of the Republic (G.A.R.) and the Women’s Relief Corps (W.R.C.) on Memorial Day, May 30, 1903. The dedicatory address was delivered by the Post Commander, Hon. William B. Perrin, followed by the unveiling of the monument and the flag salute given by the pupils of the intermediate department of the Nashua Public School. The cemetery by-laws were updated in 1959 to address the changes that had occurred over the past ninety years. The following year, it was decided that all regular future burials require a burial vault or cement box. The "New Hill" or "North Park Section" to the cemetery was plotted in November of 1963, adding an additional four hundred grave sites to the cemetery grounds. The Oak Hill Cemetery Association became an incorporated entity on November 19, 1964. The Articles of Incorporation was read and approved, then recorded with the Iowa Secretary of State on December 3, 1964. The Oak Hill Cemetery Association, Incorporated, is designated as a Code 504 Revised Domestic Non-Profit Perpetual Care Cemetery. In October of 1990, The Louis Hill Estate donated a sizable amount of money to be used for improvements and continued maintenance of the cemetery. This gracious trust provides on-going funding which has made many improvements possible, including new fencing, new water lines and hydrants, flag poles added to line the entrance, road improvements and new brick columns and gate, replacing the original archway and gate. A designated cremation section was added to the western edge of the cemetery in 2003, allowing for 125 additional burials in Row 23. Currently, the cemetery has 5,015 burial plots. The cemetery burial records were computerized in 2003, and later, the record of all deeds issued since 1870 had been indexed, digitized and added to the on-line cemetery directory. Members of the local American Legion, V.F.W., an﻿﻿﻿d other local organizations, on the 100th Anniversary of the original dedication, rededicated the Soldier’s Monument. This ceremony, which occurred on Memorial Day, May 26, 2003, honored the 75 Civil War Veterans and all other veterans buried at Oak Hill Cemetery. The Sons of Union Veterans of the Civil War (SUVCW) and local V.F.W. Post held another Service of Re-dedication and Soldier Recognition on August 29, 2004. In 2009, the association established the Oak Hill Memorial Trust, using a donation from the H. Buell Watson Estate in addition to all previous memorial trust accounts to provide future memorial care for those designated families. Scott Cerwinske- Board President; Jerry Adelmund- Board Secretary, Treasurer and Webpage Maintenance; Howard Campbell- Trustee; Craig Campbell- Trustee; Corey Cerwinske- Trustee; Larry Oleson- Trustee/Sexton; and Kathryn Pflibsen- Trustee. Feel free to contact us about our new website.